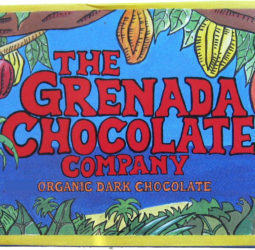 Grenada Chocolate bars are shipped to UK and Holland on the Tres Hombres sailing ship, an old-fashioned, square-rigged Brigantine 32 meter ship. And, to Carriacou, Grenada’s sister Island 20 miles away, on our 13 foot Hobie Cat. The Hobie Cat, of course, has no engine and we use the power of the trade winds to sail regularly to Carriacou with 100 chocolate bars in a waterproof box for delivery to Carriacou stores. See nice article about these voyages here. The Tres Hombres has no engine at all, only powered by the wind and travels the traditional trade wind route from Europe, Africa, The Caribbean, North America and back to Europe with the vision of moving cargo sustainably, pollution-free. The Grenada Chocolate Company has teamed up with The Tres Hombres to be the first to ever deliver sustainably a mass amount of chocolate bars across the ocean from the tropics to Europe. We have arrived in England and Holland already and unloaded all 25,000 chocolate bars from the chocolate hold in May, 2012. The bars were in perfect condition after 2 months at sea. See nice article here. Announcing the 2013 Sustainable, Sailing Boat Delivery of Grenada Chocolate bars to Portsmouth, England and Amsterdam. This time over 50,000 chocolate bars or 4 tons of chocolate! We left Grenada on Feburary 7th. Now the Tres Hombres is at sea on the way to Bermuda, then the Azores, then Portsmouth, England and Amsterdam. Stay tuned to my blog!